Along with finding some fantastic products at my local celiac support group’s winter meeting this past weekend, I also met some fabulous people too. Many thanks again to all of the BeFreeForMe members who came up and introduced yourselves. Your kind words mean the world to me, and make my work (and my world!) a lot more fun! I wanted to give a special thanks to Amanda for introducing herself to me. Your enthusiasm, support of the Healthy Villi group, and passion to spread the word about celiac disease and give back to others is inspirational! I just love the bond that all of us celiac share! Bakery on Main Granola: Made in small batches, crunchy and sweet this granola should be tried! My favorite is the Extreme Fruit & Nut Granola, which is gluten-free and casein-free. Also worth checking out are their granola bars. Everybody Eats: These guys are from Brooklyn, NY and make pizzas that do their neighborhood proud! Everybody Eats also makes a phenomenal gluten-free baguette that tastes like the “real deal” and sinfully sweet Cinnamon Sticky Buns. All are a must try! Food Should Taste Good: As always, it is pleasure to see Andrea and her yummy tortilla chips from Food Should Taste Good. My fav is the Olive. Check out their website for delicious recipes, too! Gluten-Free Naturals: If you are looking for premium baking mixes check out Gluten-Free Naturals. I tried the yellow cake mix, and it was moist and delicious. 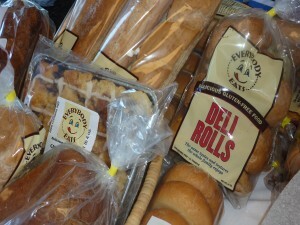 They also carry bread mixes and corn bread mix. Pamela’s Cookies and Mixes: A favorite of many celiacs, Pamela’s was a popular booth with their yummy mini-cupcakes! If you haven’t tried them yet, check out Pamela’s Cheesecakes! Cheese-alicious! Pure Bars: Certified gluten-free, vegan and no refined sugars these bars make a great breakfast or snack. Cherry-Cashew is my favorite! 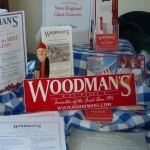 Woodman’s Of Essex: A New England favorite! Gluten-free clams, chowders, and French fries. And coming soon, a make-it-yourself from home “Chubby’s Original Fried Clams” kit can be sent direct to your door! 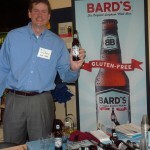 Bard’s Beer: Gluten-free and refreshing! It’s been awhile since I had a gluten-free beer, and Bard’s hit the spot! Grab yourself a cold one and enjoy! GaGa Sherbetter Sherbert: Not quite ice cream, but creamier than regular sherbet, GaGa Sherbetter is just plain ole’ … better! My favorite is the Rainbow. All flavors are gluten-free.